The Troy Lighting Mercantile 2 Light Bath Vanity brings an industrial edge to your bathroom lighting decor. A unique design that includes a hand-forged iron backplate and bar in a vintage bronze finish, the fixture showcases wire encased frosted pressed glass infusers. 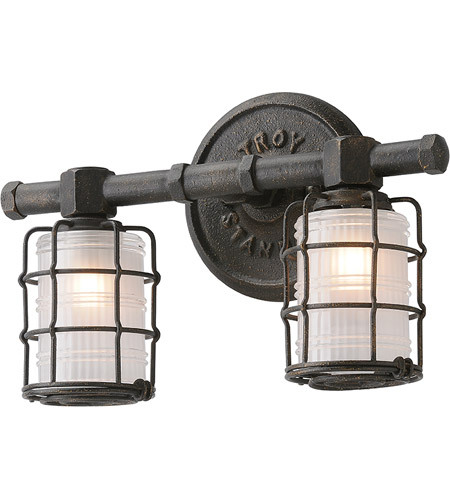 Lights connect to the iron bar with large industrial hex nuts for an authentic industrial look. 2 (50 watt) G9 bulbs offer warm ambient light to your bath.